For Bernard Tschumi, "drawing is thinking" and "being with a piece of paper and a pen does not feel like working. It can be sheer bliss", he writes, "seeing thought materialise itself in front of your eyes through the almost unconscious mediation of your hand. It is a form of notation of the mind." This collection of previously unpublished drawings, diagrams, and other remnants of the architectural process provides new insight into well-known projects like the Parc de la Villette and the New Acropolis Museum, as well as tracing a number of unbuilt proposals and speculations. 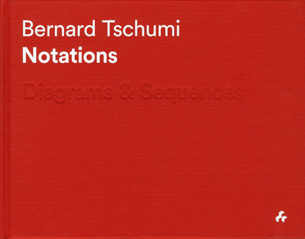 Notations (Diagrams & Sequences) offers a unique view into the working process of Bernard Tschumi and his office.